Service Costs > How Much Does a Vacuum Cleaner Repair Cost? How Much Does a Vacuum Cleaner Repair Cost? A vacuum is like any other appliance laying around the house. Sooner or later, a problem is going to arise or you may find a part is going to need to be replaced. Unlike many other smaller appliances where you can simply go out and purchase a new one, you may want to consider getting a vacuum repaired to save some money. How much does vacuum cleaner repair cost? For most repairs done by a professional, they will more than likely charge you anywhere from $15 to $55 per hour or by the job. Refer to our table below for the most common problems, along with the price. The cost will depend on the service you use, the type of vacuum you have and the problem you need to have resolved. 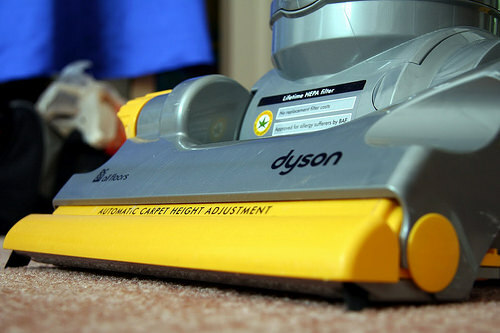 Common problems that arise with vacuums may include replacing the cords, rollers, the interior hose and/or the handle. A cord alone will cost $15 to $30. A roller, on average, will cost anywhere from $20 to $55. The interior hose of the vacuum can cost anywhere from $15 to $35. The handle of the vacuum can vary anywhere from $5 to $25. Common items that need to replaced often are the filter, a belt, and the bags if you have an older model that isn’t bagless. A bag is going to cost anywhere from $3 to $10. A belt will vary anywhere from $2 to $10 depending on the make and the model. A filter is going to cost $6 to $17. Factor in labor and the cost can double or even triple. Electrolux Vacuum Repair $200 for large repairs such as replacing circuit board. Kirby Vacuum Repair $150 for complete rebuild, according to reports. Oreck Vacuum Repair Free to original owner via warranty. Others retailing for $60 to $200, depending on repair. Rainbow Vacuum Repair $200 to $400 (older models) for complete rebuild. Roomba Repair $50 to $100 for most repairs with Roomba. Replacing battery will be more. Weak Suction $20 to $65 to replace filter and clean internal components. While most repair centers prefer to repair the vacuum in house, some may come to your home for a house call. These service fees can range anywhere from $45 to $85. This will depend on the distance the repair service has to drive. With a professional repair, the problem will be diagnosed and new parts will be installed if necessary. Most repair centers will replace the filters and do a thorough cleaning. The vacuum should almost function as new when you receive it. Most repairs should be done in less than three days. A common problem that can happen with a vacuum is that it can overheat. Be sure to let the vacuum sit for at least 30 minutes to see if it turns on again. While it sounds stupid, try additional outlets to see if the one it’s currently plugged into is having issues. Simple small mistakes can often be the problem. Be sure to replace the belts and clean the bags when necessary. Always avoid vacuuming solid objects on the ground such as a penny. These larger objects can do damage to the blower. Before calling a professional, replace both the belts and bag to see if the suction improves. Also be sure to clean or replace the filters. You’re going to want to make sure the airways are always free, allowing the air to flow through. Check the brush roller to see if it can roll freely. When you spin it, does it feel as if it’s snagging? If it isn’t, the roller or bearings will have to be replaced. Turn on the vacuum, flip it over and see if the brush is moving when it’s on. If it’s not, follow the electrical path and check the circuits using a multimeter. Highly consider doing the repair yourself. YouTube has hundreds of hands-on videos that show you how to fix minor problems. If the problem is too severe, it may be cheaper to replace the vacuum. If the repairs are more than $75, it’s best to consider purchasing another one for $150 to $200. Unless the vacuum was more than $500, make sure the repair makes sense. Most centers will be happy to give you a “rough” estimate over the phone or in person. E-mail or call at least three centers to see what they may charge you. This was for a new cleaner head assembly and a new switch in the handle that controls the different functions of the vacuum cleaner.